As a child I was fascinated by a book of Appalachian ghost stories from my elementary school library. I believe I had it checked out most of my fourth grade year. The opening story was about a motorcyclist who picked up a rain-soaked girl alongside the road. Cold and damp, he let her wear his leather jacket on the ride back to her house. Realizing the next day he’d forgotten to get his jacket back he drove back to the girl’s house. Greeted by her mother at the door, he explained the events of the prior day, asking for his jacket. Aghast, the mother explained her daughter had been dead a number of years, hit by a truck on the same stretch of road where the biker had picked her up. To prove this to the biker, the mother walked him to the daughter’s gravestone in the back yard. Behold, on the marker bearing the girl’s name was the leather jacket. Putting the jacket on and driving away, the biker felt the dampness of the girl from the day before. This dampness lingered as long as he owned the coat, which he would never wear again. It’s been nearly 30 years since I last read this book so some of the facts may be a bit obscured by memory. Therein is the beauty of Appalachian folklore: it’s reliant upon the oral tradition, with tales being passed on throughout the generations. What you hear or read today may not be wholly true on the surface but how can you prove otherwise? That’s what makes a good yarn; surface details can weather over time without altering the heart of the tale. 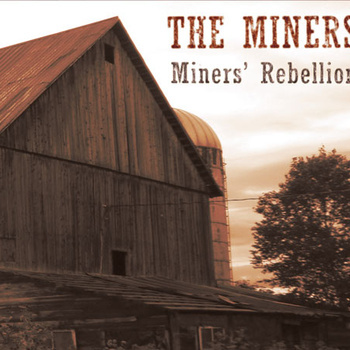 Perhaps unrelated and a bit of a stretch to compare the above with Miners’ Rebellion, the debut EP by Philadelphia’s The Miners, but on my first listen that book of Appalachian tales came right back to life in my mind. Comparing The Miners to the musicians of Appalachia is certainly unfair. They can’t be considered bluegrass (no banjo, too slow); country too is a misnomer (even with the pedal steel); folk is typically more pointed in narrative than what The Miners offer up. However, the traditional vein that does run through Miners’ Rebellion is the ballad. The opening title track lays this out right away. With titles like “I Recall” and “Norton’s Pond” among the other five songs on this EP, it’s clear narrative is in play. If I must use a tag, I’ll defer to “alt country” which the band uses to describe itself. But like most other bands bearing this moniker, the basis of the music is almost always rock and roll. On Miners’ Rebellion, The Miners chose to flavor their version a bit different. It’s both fitting and comforting. Just like those old Appalachian stories. Listen for yourself and see where Miners’ Rebellion takes you.